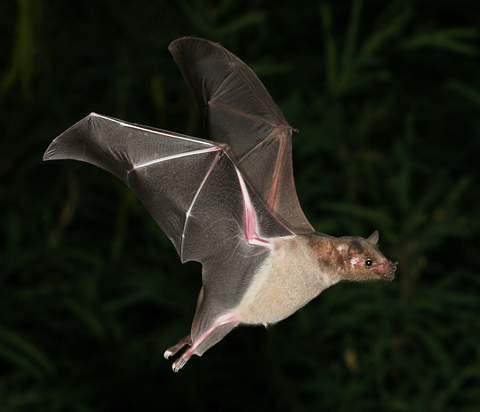 There are 28 different species of bat found here in Arizona, and while most of our bat species are insectivores (insect eaters), two of our bat species are nectarivores (flower nectar drinkers), the endangered Lesser Long-nosed Bat (Leptonycteris curasoae yerbabuenae) and the Mexican Long-tongued Bat (Choeronycteris mexicana). These nectarivorous bats are pollinators of many of our native plants like Palmer's Century Plants (Agave palmeri), Saguaros (Carnegiea gigantea), and Organpipe Cacti (Stenocereus thurberi). 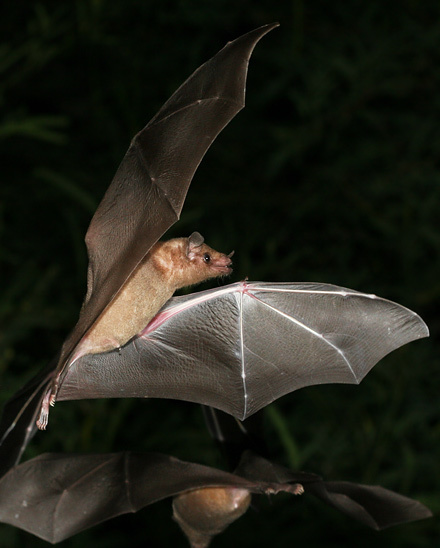 Lesser Long-nosed Bats and other nectarivorous bats can be distinguished from insectivorous bats by their larger eyes, smaller ears, and long, nectar-licking tongues (not visible unless they are feeding). 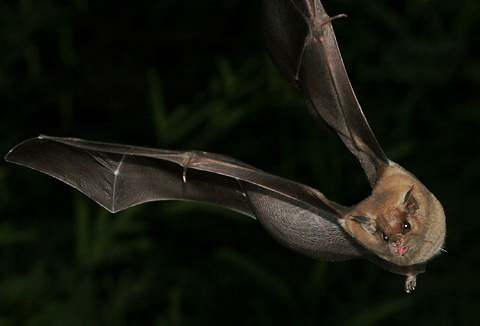 Lesser Long-nosed Bats come in varying shades of brown, and some individuals have cinnamon-colored fur. Lesser Long-nosed Bats are members of the Leaf-Nosed Bat Family (Phyllostomidae), and like most other members of this family, they posses a noseleaf (a fleshy protuberance on top of the nose). 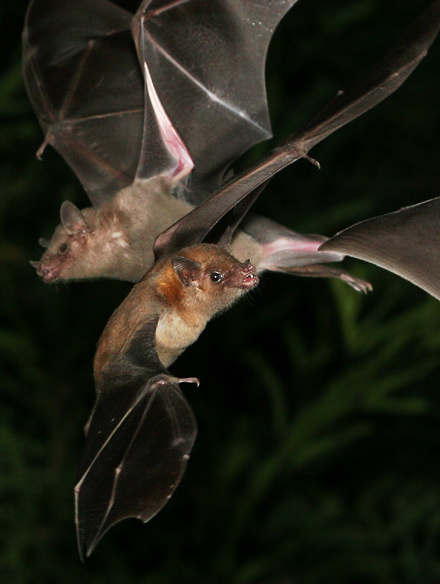 Lesser Long-nosed Bats look very similar to Mexican Long-tongued Bats, but they are tailless and have noticeably shorter, broader snouts and warmer brown fur. Lesser Long-nosed Bats are found here in southern Arizona in the spring, summer, and early fall, and they will spend the winter in Mexico. The already pregnant females will arrive here in late April, and they will congregate in large numbers in their traditional maternity colonies in caves or old mines in order to give birth and raise their young. Each female gives birth to a single offspring. Saguaro cacti bloom here in the Sonoran Desert in May and June, and the large, nectar-filled flowers of the Saguaro are a major food source for these nectarivorous bats. However, Lesser Long-nosed Bats are not strict nectarivores and will also eat the Saguaro fruits when they ripen. Male Lesser Long-nosed Bats do not arrive here in Arizona until sometime in July, and by this time most of the females and young have already left the maternity colonies and are off feeding on Agave flowers at higher elevations. Flower nectar and cactus fruits are not the only things that Lesser Long-nosed Bats will feed on. Looking for additional food sources to help prepare them for their fall migration (especially in drought years), these clever bats have learned to use hummingbird feeders. Both Lesser Long-nosed Bats and Mexican Long-tongued Bats are annual visitors to my Tucson hummingbird feeders in late August to early October. If you've ever wondered why your southern Arizona hummingbird feeder is mysteriously emptied every night at this time of year, these hungry bats are the likely cause. With their diet of liquid nectar, yellow pollen, and red cactus fruit, the watery, bright yellow or magenta guano that these nectarivorous bats produce is quite unlike that of other bats, and it can be used as a distinctive sign of their presence, either in caves, mines, or under hummingbird feeders (move feeders off of patios during bat season if they are making a mess).